Holly Said: OMGosh all the little flowers added to this sillhouette is so stunning and amazing, I think it's so beautiful. Laura Said: This is absolutely breathtaking! All of those little flowers added to this is so pretty! I love the effect it made and such perfect designer paper as well! Gorgeous job! 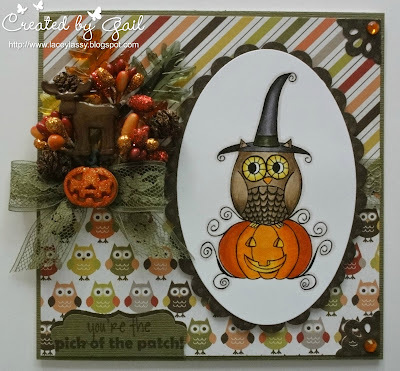 Joni Said: Love the image, gorgeous coloring, fabulous layout, super Halloween card! 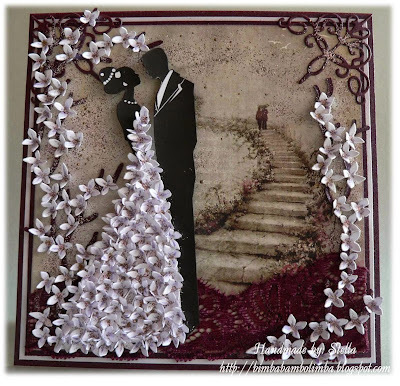 Dangina Said: Gail used an adorable image and sentiment and finished it up with the most gorgeous arrangement! Loved it! Blankina Said: Such an elegant Christmas card, love the pretty dies and great sentiment stamp. Nikki Said: Great CAS card. The style really makes the cute and beautifully coloured image stand out. Love the gorgeous, bright papers used. Love it. Shanna Said: I love this 3d project. A lot of details went into it and I love it! Nina Said: Such a cute card. I love how the die cuts have been used. Great use of the twine. Great result. Laura Said: This is so pretty! I love the rich colors and the simple design. I love the textures in the background as well! Beautiful tag!